That was a looooong . . . film to watch. At a whopping 2 hours 26 minutes, you might say that this tends to stagger on and skim through crucial events of one of the most inspirational figures of our time, Nelson Mandela. But where it might miss the mark, it is quickly redeemed by sheer emotion and acting gravitas. Idris Elba (or ol’ Luther) is a powerhouse actor and it’s great to see him given a meatier role which he delivers brilliantly. Now, I know little about Mandela. I will say that now. I know the basics which is disgusting considering he is an historical figure, whether people agreed with him or not. I was unaware of his incredible height, forever questioning why the likes of Dennis Haysbert and Idris Elba were playing such a man and why there was such a controversy about hiring “short” actors during it’s filming. But this does not undermine the man, which is what this film tries to capture. The life of one man who tried to bring change . . . and after a long tested struggle, made history in the process. Hardly a spoiler. I was ignorant but not that ignorant. This film is good, but I couldn’t help feel that something was missing. It hits hard at home and delivers emotion, but also frustrates and leads to one looking at one’s own watch. 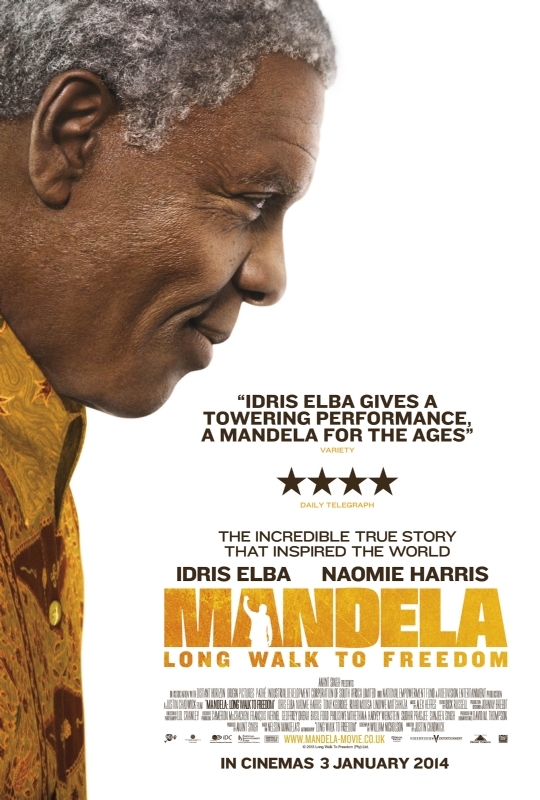 This film deals with and effectively covers the crucial points of Mandela’s life. However, there were opportunities and moments that could have been explored if the research is correct. For one thing, it was interesting to see Mandela’s tribal roots and his initiation into becoming a man. But this is quickly rushed through and we barely get an understanding of his relationship with his mother before it goes forward 20 years to Mandela as a fully qualified lawyer. Another fact I was not aware of. However, the court hearings and proceedings demonstrate Mandela’s hunger for justice and respect. It also unearths the rising racial tensions in the country. The tension is brilliantly executed and this soon spurs Mandela into peaceful protests. The film delicately deals with the issue of race. It is shocking to see how Mandela desperately and continued to be peaceful when the resisting forces relentlessly came down on them quite unnecessarily. Long Walk to Freedom is beautiful shot, bringing out the luscious natural African landscape while also capturing the gritty, dilapidated slums well. It also doesn’t paint Mandela as a complete saint, in which during his rising reputation, he was a little Luther-io (see what I did there, TV fans), sleeping around and hating his first wive’s interrogative questions. The chemistry between Elba and Naomie Harris as his second wife, Winnie Madikizela was fantastic and it’s great to see two underrated actors get given a bigger platform. The Sharpeville protests scene was violent and incredibly harrowing. It was also seen as the crucial turning point in which Mandela reluctantly went from peaceful means to violence, joining the freedom fighters. The film’s overall reception is down to how you feel about Mandela’s actions and whether he feel his bombings were acts of terrorism or protest. He targeted factories and closed offices. The film lays it out there but leans more towards the fact that Mandela did what he did for the people, which I feel is true. It took twenty years for Mandela’s cause to be noticed properly and then he was imprisoned for life for it. The scenes at Robben Island were brilliantly delivered and emotional to see the conditions and brutality the man and his fellow prisoners had to endure. At first, engaging and intriguing with Mandela attempting to gain respect in the prison and fighting against the wardens who tried to break him down, refusing to give him trousers and redacting his letters so he can barely read them. It was sad and brilliantly acted by Elba when Mandela received the news about his son’s death. The film doesn’t just focus on Mandela, it does show the plight that Winnie had to suffer through while Mandela was incarcerated. She was constantly plagued by authorities and was even put in solitary confinement for 16 months after being savagely beaten during interrogation. A truly haunting scene. The problem is Mandela, although shocking, spent years in prison and house arrest, as a film, it does push the clock a little bit. It is a great marker to delve into Mandela’s history but this could have been the complete package that I didn’t have to check on Google to make sure the events were correct as they skimmed through them. #Currently ranks at 33 out of 127.